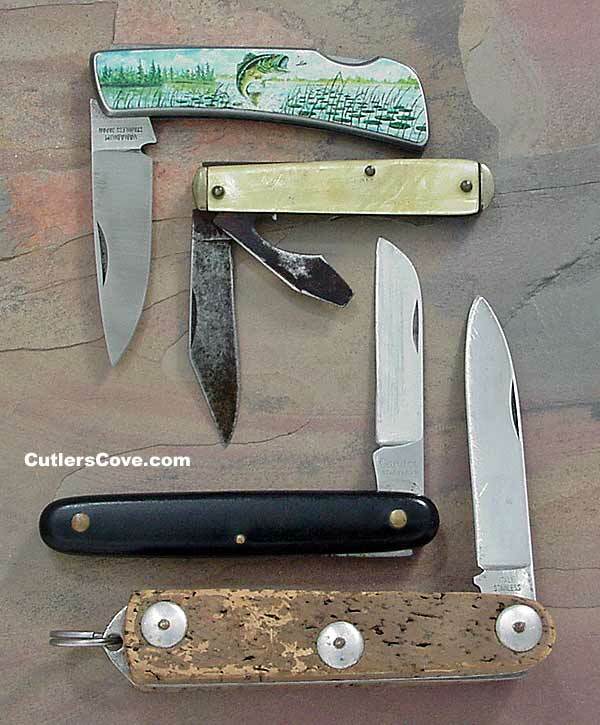 Jack knives by Camco, Fish picture handle lockback, Candco and Italian. All are excellent or better. We only have one of each knife to sale. The descriptions below match the order of the knives above. Candco stainless with black composite handles. It is in excellent sharpened condition and is made in Switzerland. 4” closed with one blade. This is called a florist knife by some and is heavy duty for its size. It does not lock. Fishing or boating knife made in Italy stainless with cork handles and lanyard ring. It is in excellent sharpened condition and may float. 4-1/8” closed with one blade. It is 1-1/4" thick on the handle. This is different! It does not lock.